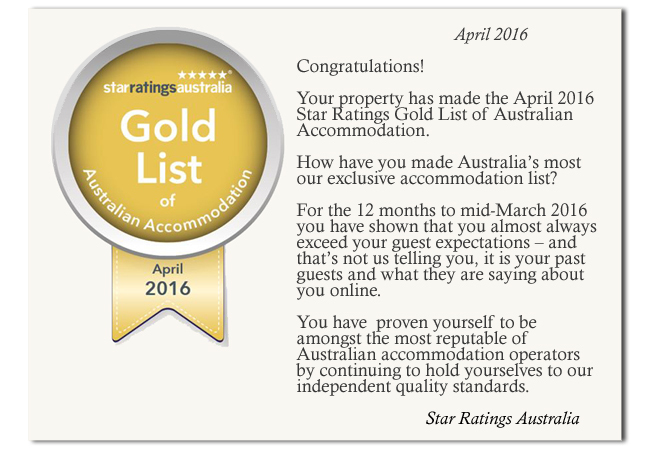 Star Ratings Gold List of Australian Accommodation. HM Awards for Hotel Accommodation Excellence – selected as a finalist in the Hotel Interior Design category (new or refurbished hotel). Thorngrove is the only privately owned finalist. Click on the article below to read about it. Haute Award 2015 Haute Grandeur Global Hotel Award – July 2015 “Thorngrove Manor Hotel the has been shortlisted to win a Haute Grandeur Global Hotel Award in 2016. 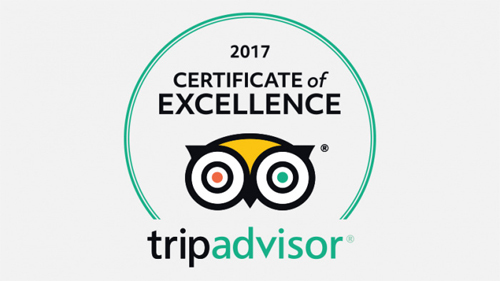 The hotel has done well in the evaluation process and received a significant high score. VENTURE Magazine focuses on the Top 10 list of Australia’s most amazingly unique hotels and we have chosen Thorngrove Manor Hotel to be included. Seven Star Global Luxury Awards take this opportunity to congratulate you on Thorngrove Manor Hotel being nominated for the coveted “Signum Virtutis”, the Seal of Excellence. Being nominated in the Seven Star Global Luxury Awards is a tremendous achievement in itself as we only select from the very best. Small Luxury Hotels of the World was named the World’s Leading Boutique Hotel Brand at the 21st World Travel Awards held this month. The awards, hailed as the ‘Oscars of the travel industry’ celebrate organisations that push the boundaries of industry excellence. Small Luxury Hotels of the World was also awarded World’s Leading Luxury Hotel Website for the third consecutive year at the event which was attended by international hospitality industry leaders. These awards build on the recent success at the British Travel Awards, which took place in London in November, where SLH collected Best Worldwide Luxury Hotel Brand. 20 HOTELS WORTH TRAVELLING TO AUSTRALIA FOR ! Yes Thorngrove is on the list with some amazing hotels – most are resorts and eco locations. We are so proud to be in the Adelaide Hills. The Advertiser, Adelaide. BEST PLACES WE”VE STAYED. SA Weekend. Truly Magical!stayz logo-14A-C01ASTAYZ Awards. 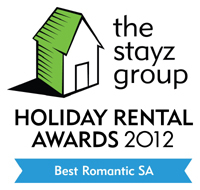 Winner South Australia, Most Romantic Accommodation. International 7 star Global Luxury Award. Celebrating Thorngrove’s nomination for an International Hotel Award -The International 7 star Global Luxury Award 2015. It is always amazing to accept such nominations as acknowledgement of our commitment and passion..
Australian Finalist Most Romantic Accommodation. Small Luxury Hotels. As a member of Small Luxury Hotels of the World since 1995, It is with great pride that the group’s achievements have once again been recognized globally. Small Luxury Hotels of the World have been awarded The World’s Leading Boutique Hotel Brand along with the World’s Leading Luxury Hotel Brand Website at the World Travel Awards which were held in Delhi, India on 12th December 2012. SLH also been honoured by Business Traveller USA as 2012’s Best Global Boutique Hotel Chain. STAYZ Awards. Most Romantic Accommodation, South Australia. Adelaide Advertiser. WOW a great year of recognition for us. The Advertiser’s Adelaide Magazine rated us as the Best Escape 2011. We think the hills are the best place in the world to live and work. It inspires us and it is passion and commitment to promote this amazing place! 2011 – 101 Amazing Hotels -2011 Hotel.com. We have scoured the globe to find the most extraordinary hotels – this collection truly displays the amazing creativity of individuals! Thorngrove Manor is currently in the top 10! A copy of ‘Luxury Hotels-Top of the World’ arrived. The editors selected, “the world’s most beautiful and spectacular hotels” -with The Ritz on the cover, no less. There are only 2 Australian properties, with Thorngrove being the smallest; actually minuscule in size, compared to the others. We are both humbled and honoured to be included in the publisher’s selection. It is an enormous achievement for us personally to have such famous stable mates and to be recognised in this global publication. Having a unique style and operational niche is a difficult, and always has been, but when such recognition comes along, it is even more special. We are totally elated, as it is just so extraordinary that such a small scale property, with such limited guest numbers, would even be considered for inclusion in such a publication. Take a Break Awards. Winner SA Unique Accommodation. HM Awards for Hotel Accommodation Excellence – selected as a finalist in the Unique Accommodation category. 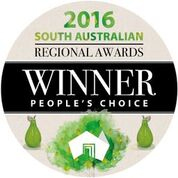 Thorngrove is the only privately owned finalist and only SA property. Relais & Chateau – Second invitation to join Relais &Chateau. Fodor’s 2009 – Thorngrove Manor is the only accommodation listed in the Adelaide Hills. The review: This romantic folly of turrets and towers is Lifestyles of the Rich and Famous written large. Opulent suites, set amid glorious gardens, have different decorative themes: a four poster bed carved with heraldic lions is the centre piece of the tapestry and brocade-draped Queen’s Chambers, and there are 1860 Scottish stained-glass windows and a Hapsburg piano in the King’s Chambers. All the suites have entrances that ensure total privacy. Bride To Be magazine – Top 10 first nights-B2BS 10 best and favourite places to go stay. Relais & Chateaux, Assessment and invitation join the prestigious Relais &Chateaux hotel group. 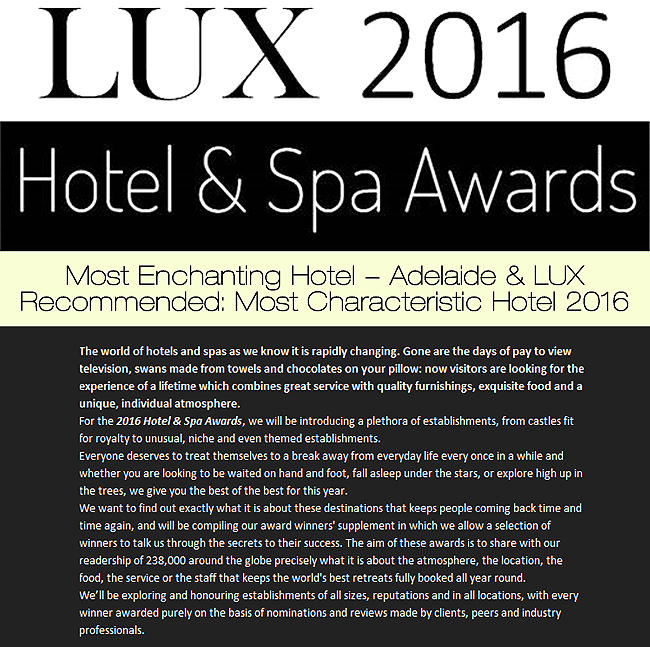 Virtual Australia (virtual Oceania)- Best South Australian Boutique Hotel accommodation. Featured in Antiques &Collectables magazine. Scenes from the first futuristic Bollywood movie “Love Story 2050” filmed. Colourfulness – China’s premium interior design magazine feature in January. Unique and Unusual Hotels of the World membership. Distinction World is a collection of the very finest hotels in the world. The book highlights hotels where quality matters. This English publication relies on visual imagery to convey such qualities. Inclusion is by invitation only. International Superstar Hotel, Northstar Media/Cahners 3rd nomination. 1.7% from over 10,000 hotels internationally deemed to be the best of their type. The Luxury Hotels and Golf Course Guide, a book featuring the world’s top 100 hotels and golf courses. The Celebration & Holiday Cookbook selection for inclusion in an international cookbook with recipes from top chefs and exceptional and famous resorts/hotels. International Superstar Hotel Cahners/Reed Travel Group USA, 1999 /2000 1.7% selected from 10,000 hotels internationally for the Star Service Award. 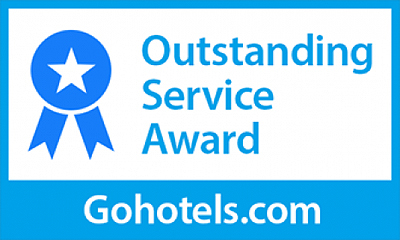 Nominated for an “International Platinum Star Award for Quality Commitment”. International award for quality control / management practices, selected by an international judging panel. Getaway TV Programme Ch 9 Top 10 Romantic Destinations In Australia. South Australian Tourism Commission. Admitted to Tourism Industry “Hall Of Fame”. Australian Gourmet Traveller Magazine Best Guest House in South Australia.1993South Australian Tourism Awards – Winner Specialist/Unique Accommodation. 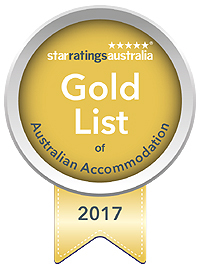 South Australian Tourism Awards – Winner Specialist/Unique Accommodation. 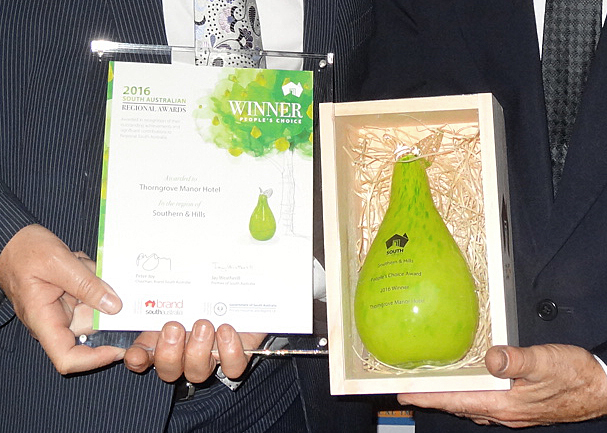 South Australian Tourism Awards, Judges Commendation Award, Specialist/Unique Accommodation.